Genworth’s goal is obviously to sell insurance. But I ran its data by a few people, and it held up well, with a few observations and caveats discussed later. On the question of whether you should buy long-term care insurance, I read a Wall Street Journal article quoting two experts, pro and con, and had a conversation with an economist here at the Center for Retirement Research. Here’s what the decision boils down to: If you’re rich, insurance is unnecessary – you can pay for the facility or home visits if the need arises. If you’re poor, Medicaid often pays. If you’re middle-class, it’s a difficult decision. Researchers have identified long-term care as “one of the largest uninsured financial risks facing the elderly in the United States.” Yet only 10 percent of people over age 60 were covered in 2000 – surely, some of the 90 percent simply couldn’t figure out what to do. Here’s why it’s so difficult to decide whether to buy long-term care coverage: There are so many unknowns. What’s the long-term care insurance you’re paying for now going to buy you in the future? If you do need it, how long will you need it and at what age? Will the premiums go up so much you’ll be forced to drop the policy? Premiums are already going up – between 6 percent and 17 percent last year, according to the American Association for Long-Term Care Insurance, a trade group for insurance agents. Prudential and MetLife are among 11 of the top 20 insurers that have stopped selling individual long-term care policies in the past five years, according to the trade organization, Limra. Others are paring back products: Genworth, for example, is suspending sales of lifetime policies and will instead offer long-term care policies with 10-year limits on benefits. For middle-income Americans, good reasons to get long-term care coverage may include preserving your hard-earned savings to bequeath to your child, niece, or the spouse who may out-live you. People without children may have more need for coverage than do parents who may move in with their offspring; on the other hand, a single person is free to sell the house to pay for assisted living since there’s no spouse remaining at home. Many Americans in nursing homes eventually deplete their money and are forced onto Medicaid – you may want to try to avoid that. The majority of nursing home stays are for only a short period of time – say after surgery – and Medicare pays for the first 100 days. But there’s a copayment, which can deplete one’s savings if he or she is unlucky enough to have a couple of medical crises. Bob Bua, president of Genworth’s Care Scout customer division, urges people to keep two things in mind: Neither Medicare nor traditional health insurers cover long-term care in a facility. “There’s no one else on your side other than long-term care” coverage, he said. About the map: the data are based on a survey of 15,300 U.S. nursing homes, assisted living facilities, adult day health facilities and home-care providers. The interactive map on Genworth’s website also has loads of state and city price data for adult day care and health aides and caregivers who will come to your home. Location does matter: prices vary widely from state to state, so long-term care may be a reason for some boomers to move to lower-cost states when they retire. Hiring a home health aide for full-time care, such as help with bathing or medications, can cost anywhere from $34,000 in Louisiana to more than $50,000 in Massachusetts, Washington, and New York. Genworth’s estimates for both home health and personal care aides, who shop, do laundry, and cook for the elderly at home assume they work full-time. However, the typical person needs a home visit three to four days per week, or an average of 15 to 20 hours per week, according to Jesse Slome, executive director of the American Association for Long-Term Care Insurance. Genworth’s costs estimates represent a worst-case scenario. The federal government’s National Clearinghouse for Long Term Care Information also says women need more care – 3.7 years – than men – 2.2 years. After scratching the surface on this issue, something became clear to me: long-term care insurance is not like car insurance, which will definitely pay to fix your entire car, even replace it, if you’re in an accident. With long-term care, there is no easy fix. For information about buying long-term coverage, Kiplinger’s provides some tips. To learn the reasons people say they buy coverage, read this blog post. Readers who want to comment on this post can use the form below, or find Squared Away on Facebook or Twitter. 1) Medicare does NOT pay for 100 days of anything. It pays only PARTIALLY and for AS MUCH AS 100 days IF the need and care qualify. 2) The broad concept of long-term care protection is not the same as traditional monthly long-term care insurance. For example, similar monthly or lump sum “long-term care” benefits are available from a number of life insurance policies, for which underwriting is easier, and from which the benefits are paid in cash, to be used however necessary. Several of those typically return all or most of premium upon request and they typically pay back much more than premium WHEN the insured dies (half the time perhaps) rather than needing care. 3) It’s distressing to see this topic discussed without mention of realities in markets: Do you think interest rates will rise? What will that do to the bonds you hold, or to your stocks? Big losses? Might it be better to have your money in an asset (insurance) that usually benefits when interest rates rise, and that will pay a guaranteed amount, at least, even if that happens? If there is a history of Alzheimers, give a policy serious consideration. Such care can take 10 years. Next is if a couple can afford a policy, don’t just put one on the wife. If the male gets sick, the wife ‘will’ have to take care of him. Too many females then end up physically and mentally broken. Better to put some type of coverage on the male. Another bit of information that was omitted from this article was the state partnership programs. In many states, if you purchase long-term care insurance (and it qualifies as a partnership plan), and you go through all the coverage you purchase, instead of having to “spend-down” to $2,000, you (or your estate) gets to keep however much long-term care coverage you provided for yourself. So long-term care insurance can be a way to protect at least some of your estate if you wish to pass something along to your heirs. When asked, most people say they want to be cared for at home. Without long-term care insurance this is often impossible without an exhausting family time commitment. This is one of the main reasons to consider long-term care insurance! As the author of The Complete Idiot’s Guide to Long-Term Care Planning, I urge readers to not miss the forest for the trees. Medicare and health insurance do not pay for long-term care. So, the question I urge every 40-60 year-old to answer is this: if you need long-term care when you’re old and grey, how will you pay for it? To put off planning today because the actual cost of care in a particular state in 20-30 years is difficult to nail down is absurd. The need for coverage does not go away, and by the time most people realize that, they wish they had it. They are either too ill to qualify or too old to afford the policy (which would have been affordable if purchased at age 50 or 60). THAT’s why I just bought a SECOND policy at age 52. It feels great to be able to tell my 2 adult children that I’ve taken steps to make sure this burden doesn’t land 100% in their laps when I’m old and might need help. Visit my site to ask questions on long-term care insurance and long-term care planning. Medicaid is not a smart solution for the middle and upper-middle classes, for many reasons, including ever-tightening financial qualifications, questionable future benefits, and a system heavily weighted towards nursing home-only care (most home care and assisted living care is private pay). All good information, but consumers today have no idea where to begin. The American Association for Long-Term Care Insurance has four online consumer guides that were originally written for Kiplinger’s Personal Finance magazine readers. They can be accessed at http://www.aaltci.org/guides and no sign in info is required. Well worth getting some good info before deciding what to do next. Thank you very much for the article discussing such an important topic that impoverishes Americans and our country everyday. It should be every Americans duty to protect themselves today without adding to the deficit of the nation. I bought LTCI through the federal worker plan. The biggest problem I see is the counter-party risk. There really is no guarantee that 20-30 years from now, the company offering the policy will not just decide to exit the business. That means you will have paid all those years and then end up with nothing when you need it. I had enough faith that OPM would have enough clout to make this less likely. But I would not have bought a plan on the open market because there is no one looking out for my protection. This is all great information, but as Jesse above said, today’s consumers have no idea where to begin. I bought long-term care through the federal government offering. I paid top dollar since the rate was supposed to be stabilized over time. Well guess what, after years of paying, the rate went up. I was hoping someone would sue OPM. I encouraged my sister to buy also. Well, she is in an assisted living facility, and the long-term insurance won’t pay. You have to need help bathing and/or eating and/or dressing. She needs to be in an assisted living facility to give and monitor her many prescriptions. Guess what? That’s not criteria. Be careful. It’s expensive and the fine print kills you. Over the past 25 years, most things in this world like computers, cars and cell phones, have improved dramatically. The same is true for long-term care insurance. Comparing long-term care policies from 20 years ago to today’s policies is kind of like trying to compare the Radio Shack TRS-80 to a MacBook or an iPad. For example, there are now two types of long-term care policies that can never have a rate increase. Here’s a brief explanation of them: http://bit.ly/Level-Premium-LTC-Insurance. First, you select a company that has been around for a long time. MetLife and John Hancock has been in business since the 1860’s. The company I selected started in 1895. Second, you want to check their financial ratings for the past five years through Moody’s, S&P 500, Morningstar, etc. See that they have consistent high ratings. THEN, compare their rates. And, remember, it helps to have a good family health history yourself. This will determine whether you will be paying the standard rate, superior rate, or some substandard rate which would be higher. And check, if you can, how their rates history is. You might want to pay a little higher rate with a company that has shown to not raise their rates. I might consider a policy to cover a “long tails” event (statistically rare but severe). I believe my wife & I could afford at least two years of care self-insured. But the policies I saw offer only a 90 day waiting period, followed by, at most, five years of coverage. A two-year wait should be much cheaper, even if it offered as a longer term of coverage. Wow: This article on long-term care has already elicited 13 meaty comments, making clear that I’ve only scratched the surface and need to write more stories about it. Perhaps you’d like to see what other readers have said and respond to them — let’s keep the information and debate flowing! The reason I didn’t get long-term care insurance is that caretakers are often individuals from other countries. As Baby Boomers age, the demand will be greater than the supply, especially as we close the borders more and more. Some policies allow family or neighbors to be paid for caretaking, although when 24-hour care is needed 7 days a week, most do not want to work for what turns out to be much less than the minimum wage. Great article, I think. I am 45 and in great health as a marathon runner. I have LTCI and have had it for about three years while the premiums were low for me. I don’t want to burden my wife and two adult children with huge bills from an extended stay in the hospital or for extensive home care. Can anyone tell me if I am correct in my assumptions and that LTCI is a good idea for my family? I bought into the federal plan when I turned 40. At the time, I considered two things: A) when is the best time to buy for the cost benefit ratio? & B) is it the cheapest insurance which invests into my future? I hope I never need it; hence, why it’s insurance. However, if I do need it, then what I’m now paying monthly for is buying into my future comfort…a deal. Not to mention the peace of mind I receive now that I’m retired. For those who feel comfortable buying from a “long established company,” I say remember PanAm and big companies like them. The problem is that there are no clear and convincing facts that something purchased at age 45-50 will actually pay off for most of us, given the uncertainty, fine print, inflation, risk of insolvency, etc. Many companies have cut benefits, increased premiums, etc. without notice. There are also too many ‘slick’ LTC insurance salesmen with commissions to earn and who profit from the confusion. That tells us something as well. LTC insurance is not for when you get old, it’s for every moment after you buy the policy. Visit a nursing home and check out the 40-year-old victims of drunk drivers. I don’t mean to warn that interest rates could rise or when that ultimately happens it will hurt insurance companies. Insurance companies aren’t bond traders (not like banks)…they buy and hold until maturity (generally). They traditionally profit from rising rates, unlike your bond mutual fund. The companies will survive through hell and high water. When they choose to leave the market they do continue to pay. If they raise premium rates (and you can buy policies that won’t allow that) they still remain bargains. The Federal program is a contract with a giant private insurance company and it never promised fixed rates…and it’s one heck of a great deal. And yes, insurance salesmen do make money on the deal, so if you aren’t a capitalist and don’t want an expert to talk to you, then surrender to the probability that you’ll lose all your assets and wind up on welfare in a nursing home (Medicaid). The best thing about LTC insurance is that almost all policies take care of you at home. Here in the UK, our prime minister David Lloyd George introduced old age pensions in 1908 at five shillings a week for those over 70. Generally speaking, he was on to a safe bet since the majority of working class people died well before they reached that age. Nowadays (depending upon which figures you accept), the average age of mortality has reached over 80. New advances in treatments, particularly long-term ones such as statin or anticoagulent treatments, will push that level even higher over the coming years. Unfortunately, statistically, for the last 8 years of their lives, these elderly people are going to need some form of care, ranging from day-to-day assistance from a health visitor to full nursing home care. Nearly 90% of people here have no private health insurance, but rely on the state, which so far has done a pretty good job; but the problems are mounting as they are in the USA. The trouble is: in both countries, life expectancy is rising. This brings one huge complication; people who would get old and die are having a few extra years of life. In many ways this is a wonderful situation but like everything else there is a drawback, which is that the cost of health care for these survivors is escalating. A lot of tough decisions are going to have to be made which are not helped, at least over here, by ‘crusading’ newspapers that latch onto every instance they can find of elderly nursing home residents being forced to pay for their care if they have assets, whilst those who have never saved money or bought a house of their own get it free. The system here is creaking ominously and things cannot continue this way for much longer. Young people need to be encouraged to join health care insurance schemes at an early age and not trust to a state subsidized system which may not exist by the time they need it. You are correct. NYS is tightening Medicaid eligibility because it’s bankrupting the state. None of the comments address the problem that most Americans simply can’t afford LTCI. The NRRI estimates that half of Americans are behind in saving for retirement. EBRI’s annual Retirement Confidence Survey (and virtually every other estimate of retirement savings) reveals how few Americans are prepared for the costs of simply living in retirement. Most middle income/asset Americans need to put any money they would consider paying for LTCI premiums into a qualified retirement account invested in diversified investments to finance the general costs of living in retirement. I don’t disagree that we are facing an unfunded LTC epidemic but simply saving enough for basic essentials in retirement should be a higher priority. Only after you have saved enough for basic retirement expenses should one consider LTCI. The more people who read Squared Away the better, so please feel free to share our work. Anytime! Most people think that purchasing long-term care insurance is a gamble. In my opinion, it’s not really a gamble, but a preparation for the future. Statistics would show that millions of Americans will need long-term care in the future and most of these people face the future with no coverage at all or just by relying on Medicaid. In my opinion, it’s much better to be ready than find yourself in a huge financial problem later on. And in the worst case scenario, you’ll become a burden to your family. To avoid situations like these, retirement planning is imperative. You can start off by having a health assessment, comparing quotes from different long-term care providers, benefits and premiums. 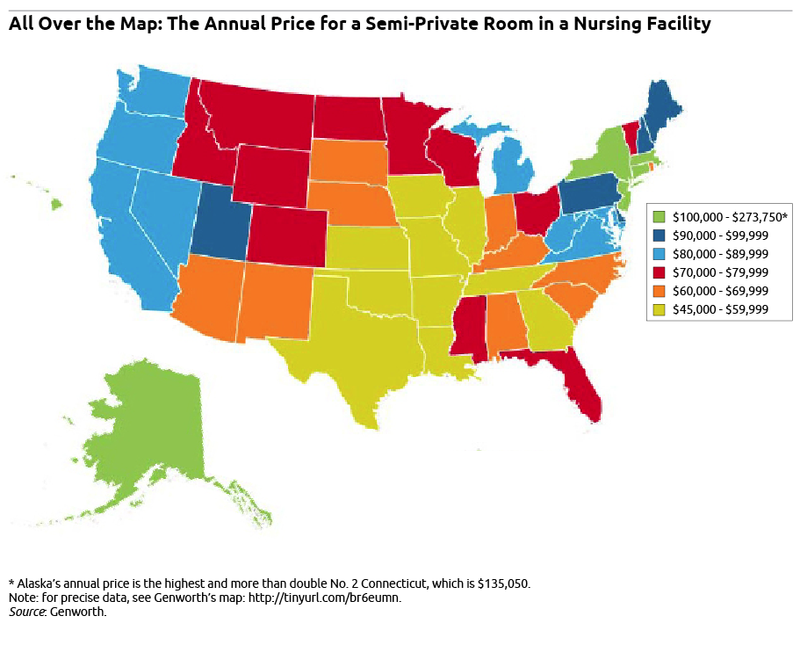 It may seem expensive but Genworth’s map shows that it’s more expensive to pay for long-term care expensive straight from your pocket since the costs continue to increase every year. For me, it’s still a lot cheaper to purchase coverage than to use your savings in paying for your long-term care expenses. It’s hard to decide if you don’t have a strong grasp of what is long-term care insurance and what are the benefits. To help you come up with a decision, feel free to watch this: http://www.youtube.com/watch?v=sh0bmOcjSdg. Regarding Maynard’s comments, if a LTC insurer decides to “exit” the business they still can’t cancel your policy. The insurance regulators have required that every LTC insurance policy be “guaranteed renewable” which means that the only way the insurer can cancel your policy is if you do not pay your premium on time. Regarding Fred’s comments, there are long-term care policies that have “two to three year” Elimination Periods. And some of these policies even have no limits on how long the benefits can be paid. For someone who is considering self-insuring this type of policy is a perfect solution to eliminating the long-tail risk.